The universities and Hochschulen in Bremen and Bremerhaven accept UNIcert® III as a C1 qualification. Furthermore, most academic institutions in Germany accept UNIcert®. An overview of these institutions is available on the UNIcert® website. 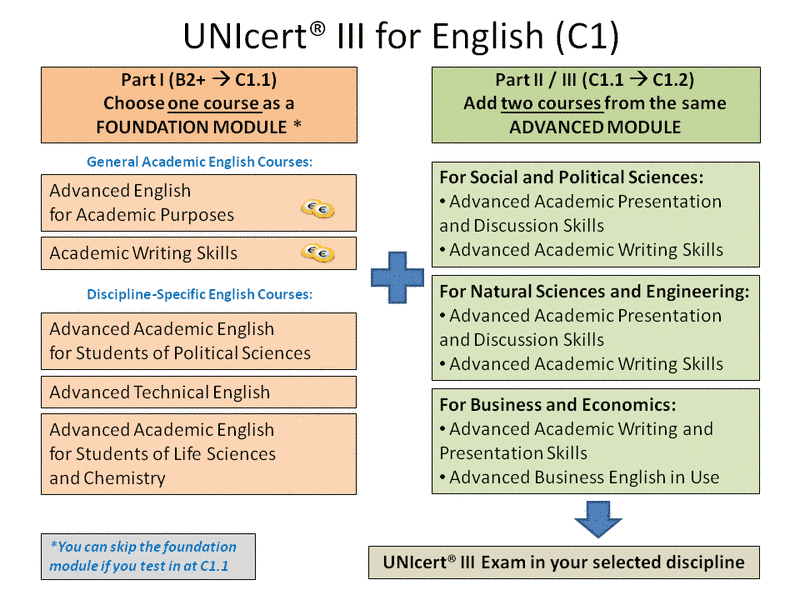 If you are interested in obtaining UNIcert® III, you first have to take one of the foundation modules, which are offered for general academic English and also for a number of specific disciplines. You then have to do two courses in an advanced module in one of the three specific disciplines that we offer. When you have successfully completed all the required courses, you are then eligible to take the separate UNIcert® III test in the specific discipline you have chosen. The tests are offered on a regular basis once a semester. If you achieved level C1.1 in the C-test, you need only successfully complete both parts of the advanced module to be eligible to take the UNIcert® III test. and select the correct exam from the list given at English C1.